I thought I would report on some Homesteaders play this past Tuesday night. I had posted on the Hypermind Guild at BGG that it would be Tasty Minstrel night from me. I took Homesteaders, Eminent Domain, and Terra Prime. I got at least two “I want in on Homesteaders.” replies. So it looked like a good night coming. And it was. Though I arrived late, a couple of guys were ready to play. So after a game of El Grande we broke out Homesteaders. Both of the other guys had played once previously so rules overview went quickly. Chip really started off well and very obviously went the workers route. Keith was more stealthy and ended up going the railroad route. I had a bad first two rounds and never caught up. In the end Chip won by one point over Keith – 48 to 47 with me a distant 22. Both of them really like the game and asked me to keep bringing it. I think the depth is apparent once you get one play in. And Adam, who requested a seat, did not show so there is one more who wants to play. And Chris (GamerChris.com) wanted in but someone wanted him to teach them Survive so he bowwed out. 2010 was a great year for gaming for me. The biggest thing for me was I joined The Hypermind Boardgamers. This is a fantastic gaming group located in Burlington, NC at Hypermind, my FLGS. Hypermind is made up of some awesome gamers who love games of all types. This group has opened up some many excellent games to me. I discovered Macao, The Princes of Florence, Ra, Goa, Saboteur, and many others. But most of all I’ve made some really good friends. And strengthened others. Tuesday nights became a highlight of the week and are much looked forward to. I’ll be glad when I’m able to make the trip on a regular basis again. Purchase wise I picked up some good games. Forbidden Island, Notre Dame, Settlers and Seafarers of Catan, Small World, Zooloretto, a couple of the 10 Days games, Saboteur, Terra Prime, Homesteaders are the stand outs. My kids and I played a lot of games too. 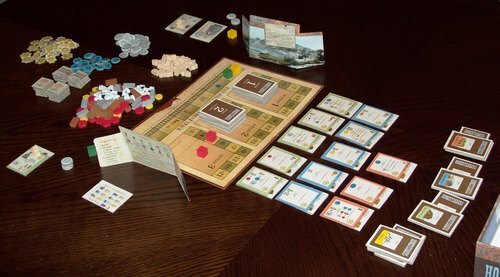 Homesteaders was a big hit with O. Small World and Saga were Z’s favorite. And Memoir ’44 continued to be at the top. Here’s what I played this year. That’s it I think. Total of 78. Not too bad. So which ones rose to the top. These are the top 14. 7. Hey! That’s My Fish! Macao really stood out for me. It was the only game that haunted me. I could not get it out of my mind. I thought up strategies, drew out the rondel, worked on dice/turn combos. And I’m still not that good at it. I really enjoy the game a whole lot and want to play it all the time. That’s why it is number one. Pandemic is #2 because it is such a great gaming experience. The tension it builds and the high-five moments are awesome. The rest are all very good and fun games and are on the Buy List for this year. What do you think? How about your thoughts on these games or your favorites from last year? Comment below. There are a bunch of games that didn’t get played and ones that are coming out this year. But that’s another post. So that’s 2010 in brief. It was a good year for gaming. The best parts were definitely finding Hypermind and my kids getting deeper into gaming.